Lillie West recently sheared her own hair to look more like an elf, but Tuesday's spell was cast by more than just her trembling bangs. When she and her band hopped onstage, their feet flushed heat-lamp red, the entire room began to shimmer. Lala Lala is winter music because of its extremes: its angst is comfortable clenching both frenzy and oblong regret; you can see its foggy breath as it also thaws your toes. West and her crew could have slammed with the chaos, but they played so tenderly. Not that the songs were spongy — pangs flared in Lillie's bellows and frantic strums — but it was the way they were handled. West beamed at her band members while they felt ferociously. She rested her forehead against the microphone like a weary lover. Lala Lala's gentleness conjured a tenuous safety that verged, for some, on the romantic. (In other words: so many people were making out.) One duo mouthed "You are the reason—" to each other, only to swallow each other as West finished the actual sentence: "—my heart broke behind my back." 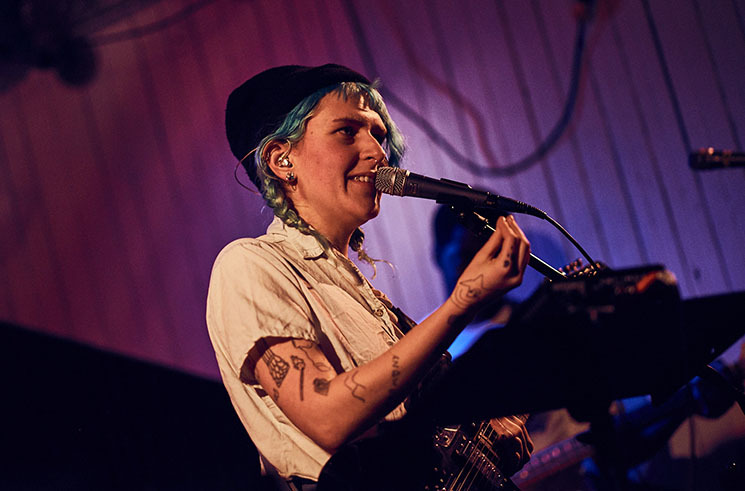 Because the reverb quadrupled Lillie and her lingering British accent curled her vowels like wood shavings, the set felt like some kind of elven incantation. "Keep my friends safe night and day / Keep my friends safe now and always," she chanted to something, each strum cloaking St. Laurent with snow. But Lala Lala are young sprites who don't know their power. They make cold ears glow pink. They accidentally make everyone fall in love.